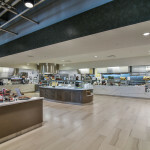 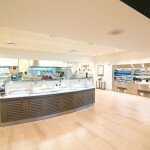 A. Martini & Co. built an 8,000sf dining hall and kitchen in Crown Castle’s Southpoint Campus. 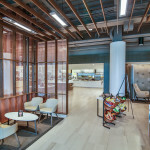 Our team has been working as Crown Castle’s exclusive general contractor for the last five years in each of their facilities. 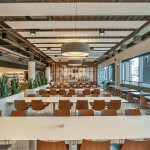 The cafeteria project came after completing the renovation of 90 percent of their corporate offices, between two buildings, due to their expansion of departments and staff. 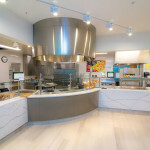 The goal was to build a cafeteria with the character typical of a museum café, which would include bright, open spaces with clean lines and neutral finishes. Crown Castle’s mission for this area was to build a space that would draw their staff in for informal team meetings or scheduled appointments, while also providing an open area where staff could work, and escape the typical “cubical” work stations. 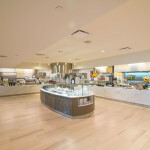 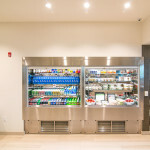 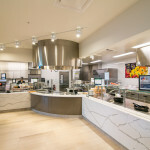 The main kitchen area includes multiple coolers, refrigeration units, pizza ovens, carving stations, back of house prep areas for breakfast, lunch and large meetings on Crown’s campus. 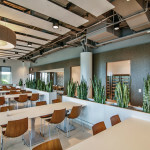 The dining area seats 146, utilizing a combination of tables, chairs and banquette seating. 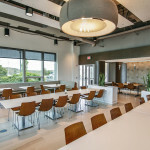 The construction and open floor plan, along with the furniture selection, per Crown Castle’s request, creates a sense of community and allows a variety of seating choices. 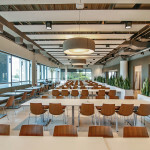 Crown Castle chose to stick with a more industrial and airy feeling, utilizing large pendant light fixtures, down lights and acoustical plan ceiling tiles above the seating area. 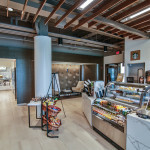 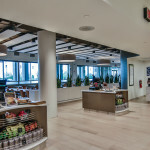 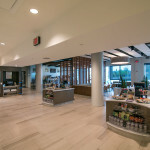 Another feature added to this space was a Starbucks-type barista which serves coffee and snack items and is at the front of the cafeteria, allowing staff to purchase items even when the cafeteria is closed between service times.